As parents, it’s important we educate ourselves about the unhealthy messages the media sends to our daughters. Here’s what we can do now to instill healthy body image so our daughters don’t fall victim to these harmful messages. From a young age, our daughters are inundated with images and messages in the media focusing on physical perfection. And now, websites offering young women tips on how to develop eating disorders are cropping up at an alarming rate. Since we can’t completely protect our daughters from the pervasive media messages and dangerous websites, it’s crucial we foster in them a healthy body image as a strong foundation that will help them withstand the constant barrage of unhealthy messages. But how do we do that? Armed with a bit of knowledge, it’s not as tough as you might think. To help build your daughter’s self-esteem, compliment her efforts, skills and achievements rather than her physical appearance. Of course our daughters are beautiful, but they’re also smart, responsible, funny, artistic and kind. A 2012 study published in the Journal of Child Psychology and Psychiatry found that when girls based their self-esteem on attributes other than their physical appearance, they felt significantly better about themselves. Since it’s impossible to shield our daughters from our society’s unhealthy messages about beauty, we can use those same messages to open a dialogue about how things aren’t necessarily what they seem. Critical thinking skills are one of the best tools we can offer our daughters. As a great example of what hair, makeup, and Photoshopping can do, check out Dove’s Evolution commercial, which lays the groundwork for real discussion on the media’s distortion of beauty. By emphasizing our daughters’ efforts, skills and achievements, talking with them about the media’s distortion of beauty and showing them we love our own bodies, we can help foster their healthy body image, which will serve them throughout life. 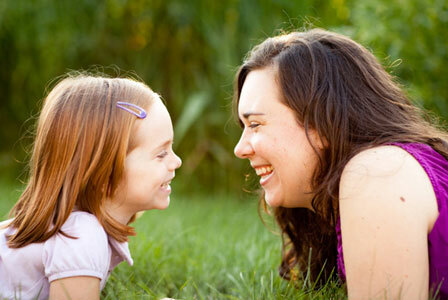 Does your mother influence your body image?